A Summer Without The News? When I was in college, one of my roommates never watched the news. She said it was too stressful and interfered with her sleep. That just didn’t make sense to me 30 years ago. How could you go about your life without knowing “what was going on? ” I couldn’t imagine myself being that ill informed. It makes sense now, though. I started this blog in an effort to reduce the cynicism in my life. I realized it was a downward drag on my life, and made me a bad influence on those around me. During the 2012 election, the cynical, lying ads from all sides of the political spectrum made me sick. So I decided that I was going on a journey – away from cynicism. My friend posted a blog about giving up all news for the summer – a sabbatical from the news, so to speak – http://trinkaj.blogspot.com/2014/05/a-news-free-summer.html. Could I do it? Could you? I am thinking about following my friend’s lead. 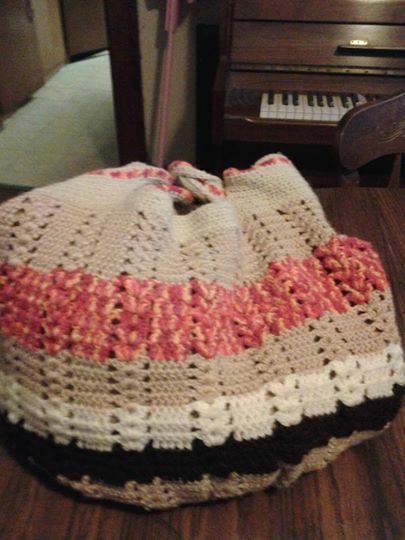 My mother made a crocheted bag for me. I told her that she could sell them for $40 in boutiques. But she just enjoyed crocheting these and and enjoyed giving them away. 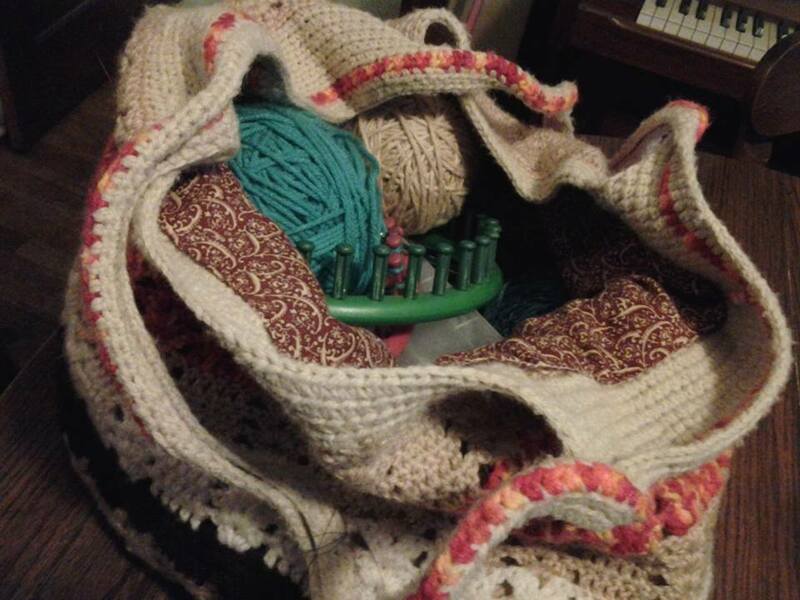 She is 79 now, and her hands shake too much to crochet anymore. She lined them, which made them extra nice. When my parents moved to Florida 18 years ago, my mother and father sold most of their furniture and household items. But they gave a few items to me and my siblings. 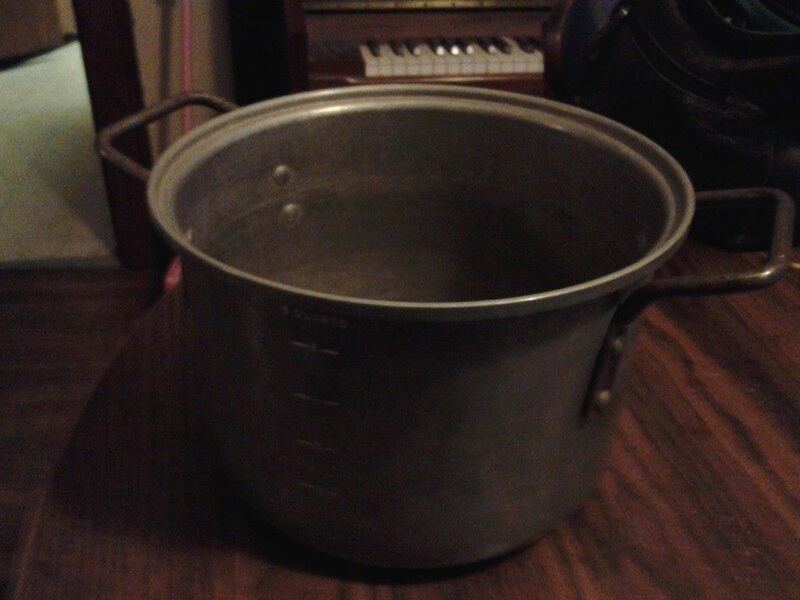 The furniture they gave me wore out, but I still have this wonderful, heavy gauge pot, which in my house is used to make chicken and dumplings. The lid used to have a handle on the top made of an old wooden thread spool. A wonderful gift, and I think of my mother when I use it. When my parents entered their 40s, they took up new hobbies. My father began running, inspired by Jim Fix’s book, The Complete Book of Running. He ran the 10k River Bank Run in Grand Rapids for many years. My mother took an oil painting class when she was 40, and began painting landscapes, and giving them away as gifts. When they went camping in their RV, my mother would stand outside the camper at her easel painting. Many of the walkers in the campground would stop by to have a chat and see what she was up to. She was a very shy person, so this was a way to meet people. 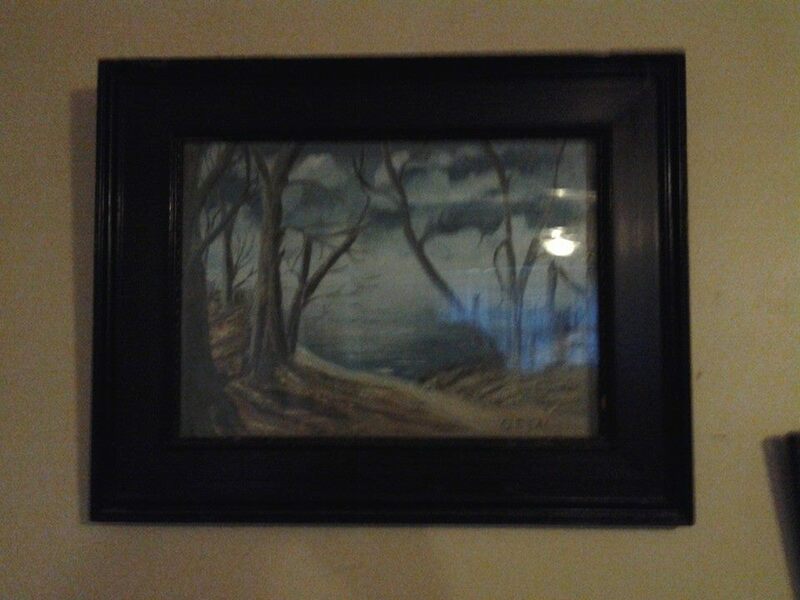 The painting in the picture below is a gift from her, which hangs on a wall in my house. When I look at it, I remember a fishing trip to Mud Lake in the northern lower peninsula with my family and grandparents. There were black, dead trees in the water and along the shore. 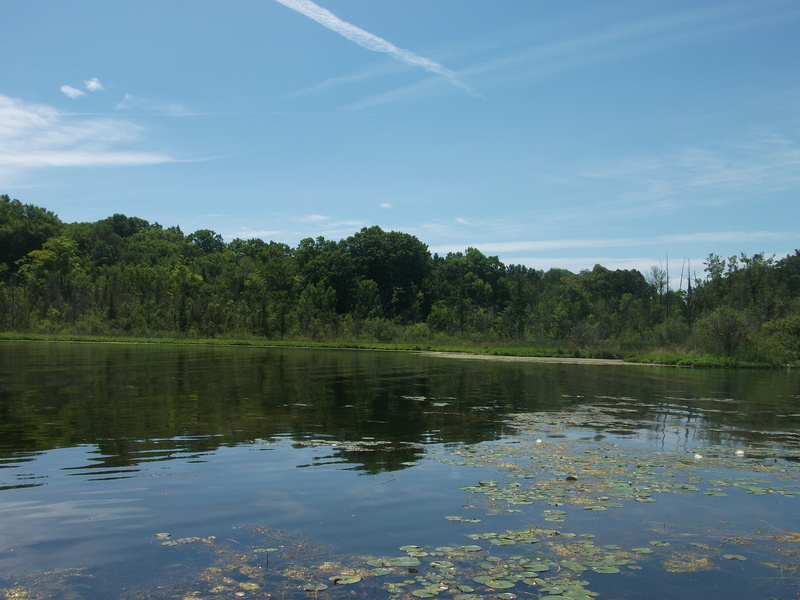 My brother told me that the lake had formed suddenly from a sinkhole, taking trees with it. There are a lot of sinkholes up north. The true gift of this painting is my parents’ sense of adventure and trying new things at their age. As I have gone through my 40s, I also started new things – going back to school, starting a new career, picking up the writing pen once again. Do you have any gifts which have inspired you?